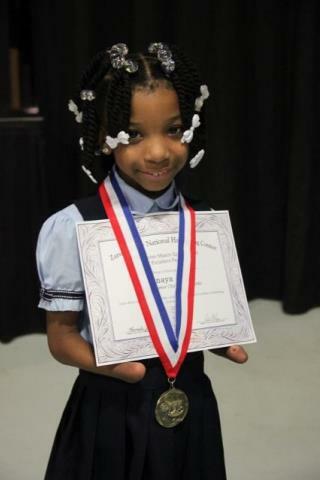 (Newser) – A first-grader from Chesapeake, Virginia, won a national handwriting award this week—no small feat considering she was born without hands. "We looked at her writing and were just stunned to see how well her handwriting was," the competition's director tells ABC News. CNN reports 7-year-old Anaya Ellick was born without hands and has so far foregone prosthetics. "Anaya is a remarkable young lady," says her principal at Greenbrier Christian Academy, Tracy Cox. "She does not let anything get in the way of doing what she has set out to do." It was Cox's idea for Anaya to enter the handwriting competition. Anaya went on to beat dozens of students from around the country to win the Nicholas Maxim Special Award for Excellence in Manuscript Penmanship. A vast lost art. Kids learn to use pad devices first. Then they learn basic writing and not even as a skill. I remember the calligraphy pen set we had to buy in Jr. high. It had the various nibs and such. I used that set well into college. I was often called on in my first job to make up certificates for employees. I'm not even a talented artist but we had to learn how to write with the fanciful characters. Now where I failed was when a friend wanted me to pay his rent while he was abroad. I went to his home and found his checkbook where he had hid it. I got it out and then started writing out the amount. Then I realized I hadn't written a check in decades. I had to practice first. I am fairly sure kids don't do that. I can remember first grade where the teacher gave us sheet of paper that had like 4 checks to fill out. Then to make it fun, she gave us each a made up checkbook to use to buy stuff in the class store. We got the credit to buy items based on doing our chores, like cleaning out the hamster cage, pounding out the erasers, sweeping the class, arranging the chairs in our usual circle, and such. Poor kid, no hands. I hope she doesn't have to endure too many idiots, and lives a life of love. Her handwriting is amazing!! Great job, lovey! !